April 21st was the Club’s Spring Fling at the Severna Park Golf Center, hosted by Karen and Bill Kranzer, for practicing golfing skills and the occasion for a party. At left are Karen and Bill Kranzer. Click HERE for more photos. May 5th was the Club’s Cinco de Mayo Season Kickoff and New Member party at Oyster Cove in Grasonville, hosted by Mary and Richard Ross and Madi and John Yates. Members arrived by water and land, enjoyed blessings of the fleet, watched the Kentucky Derby, and celebrated in good Mexican style with Margaritas, Sangria, and assorted Mexican beers with appetizers such as Chicken Taquitos, Cheese Quesadillas and Chips, Salsa, Guacamole followed by a deliciosa Mexican buffet of Steak & Chicken Fajitas, Chicken Enchiladas, Mexican Rice, Beans, and all the trimmings, followed by Key Lime Pie. Sailing events start up in earnest with the Club’s Memorial Day cruise to the Chesapeake Yacht Club, Shady Side, Maryland for a weekend of patriotic activities, including games, for a traditional Memorial Day weekend. The Chesapeake Yacht Club offers a pool, an outdoor bar, a tent area with tables, horseshoes, and plenty of lawn space for bocce ball and a great restaurant. Come join us. Check BCYC out at http://www.backcreekyc.org and enjoy the fun. I would like to invite any Back Creek Yacht Club members who can to join Terry and I for the Night at the Races. I am the Board Treasurer for the Volunteer Center of Anne Arundel County. It should be fun and it's a worthwhile cause. The Fourth Annual "Nite at the Races” will take place from 7 to 10 pm on Friday, May 11, 2012, at the Loews Annapolis Hotel, 126 West Street, Annapolis, MD 21401. Join the Volunteer Center For Anne Arundel County in celebrating 10 years of helping people in Anne Arundel County volunteer. BOATING SEASON STARTS ON THE WATER IN MAY! A number of events have helped carry the Club through March and April, up to the boating season. An Irish Night on March 17th at the Naval Clubhouse at Greenbury Point in Annapolis, provided the venue for the Club to celebrate with Irish food, live music, and most delightful and energetic Celtic Dancers. On March 31, a Final Four Friday Happy Hour was held at Ray and Brenda Ripley’s Townhome in Annapolis to enjoy the basketball playoffs. Patti and Bob Bartlett hosted a Lucky Friday the 13th Happy Hour at their home in Annapolis. An April 21st Spring Fling occurred at the Severna Park Golf Center, hosted by Karen and Bill Kranzer, allowing for practicing golf skills and the occasion for a barbecue. May 5th will be the Club’s Cinco de Mayo Season Kickoff and New Member party at Oyster Cove in Grasonville, hosted by Mary and Richard Ross and Madi and John Yates. Whether members arrive by water or land, there will be blessings of the fleet along with great food, and an opportunity to recognize and formally welcome new members. Members will enjoy Margaritas, Sangria, and assorted Mexican beers with appetizers such as Chicken Taquitos, Cheese Quesadillas and Chips, Salsa, Guacamole followed by a deliciosa Mexican buffet of Steak & Chicken Fajitas, Chicken Enchiladas, Mexican Rice, Beans, and all the trimmings. Dessert will be Key Lime Pie. Take advantage of our Free Guest Membership, good for a month and attend an event as our guest, meet people, and find out more about us. Visit us at www.backcreekyc.com. Sailing events start with a mid-May raft-up followed by the Club’s Memorial Day cruise to the Chesapeake Yacht Club, Shady Side, Maryland for the weekend. Backyakkers marched through the month with bookended happy hours. March 2nd found us at the lovely 'Winter Home' of Pam and John Loving, where an Island theme prevailed. Members donned their favorite Caribbean shirts and did what we do best...had a blast. Click HERE for more photos. On March 31st, Brenda & Ray hosted a 'Final 4' party at their beautiful townhouse in Edgewater. There we watched basketball with a side of mini helicopter races. Click HERE for more photos of members and UFO's careening around the room. The jury is out on whether Colin or Ray won that one. Another great time was had by all. Club members attended an Irish Night on March 17th at the Naval Clubhouse at Greenbury Point in Annapolis, with Irish food, live music, and most delightful Celtic Dancers. A Final Four Friday Happy Hour was held on on March 31, to root for their favorite team at Ray and Brenda Ripley’s Townhome in Annapolis. 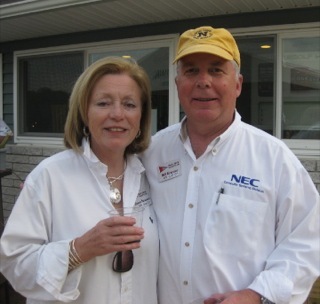 On April 13th Patti and Bob Bartett hosted a Lucky Friday the 13th Happy Hour at their home in Annapolis. These will be followed up April 21 by our Spring Fling that will be held at the Severna Park Golf Center, to be hosted by Karen and Bill Kranzer. May 5th is the Club’s boating season’s kick-off event, with an opportunity to have a blessing of the fleet, great food, and to recognize and formally welcome new members. It will be held at Oyster Cove in Grasonville on Kent Island and hosted by Mary & Richard Ross. A mid-May raft-up is in the offing, before our Memorial Day cruise, to be followed by the season’s big event, our Annual Cruise, in June. For those interested in participating, take advantage of our Free Guest Membership, good for a month. We want to answer all your questions about BCYC and get to know you. Use the opportunity to attend an event as our guest, meet people, and find out more about us. Check us out at www.backcreekyc.com and Membership Chair JJ Sullivan will contact you to help you get started with BCYC. Our membership is "dual"--meaning up to two people (you and your spouse, or boat partner) are eligible to join for one membership fee. A rash of parties to tune up for the upcoming sailing season followed BCYC’s well-attended February 18th Mardi Gras party. A Leap Year Celebration was held Mid-Week on February 29th at Yellow Fin in Annapolis and the Club’s Saint Patrick’s Day Party was held March 17th at the Naval Clubhouse at Greenbury Point in Annapolis, with a focus on Irish food, live music, and entertainment, including Celtic Dancers. Member’s Ray and Brenda's Townhome was the site for celebration of March Madness with the Club’s Final Four Happy Hour party on March 31st. In April, BCYC events start with a “Lucky April Party,” Friday the 13th to be held at Patti & Bob Bartlett's Home in Annapolis. The Club’s “Spring Fling,” will take place April 21st at the Severna Park Golf Center (hosted by Karen and Bill Kranzer). May 5th is the Club’s boating season’s kick-off event, with an opportunity to have a blessing of the fleet and to recognize and formally welcome new members. This event will be hosted by Mary and Richard Ross and will be held at the Oyster Cove Clubhouse for those coming by land or water. A mid-May raft-up is in the offing, before our Memorial Day cruise, to be followed by the season’s big event, our Annual Cruise, in June. BCYC South burns up Venice! The stars aligned on February 23rd when 14 BCYC members converged in Venice, FL. John and Jo and Mary and Richard sailed Harmony into the Crow's Nest where we met up with the Sangers and Wilsons. The Falks, who were visiting Jamie Ritter in Nokomis joined in and JJ and Julianna spent hours on the road from Captiva to meet up with us. Was it worth it? Yeah, man! as my teenage nephew would say. We had a great time! Jamie received kudos for playing concierge and setting us up for dinner on Thursday evening and dinner and dancing on Friday evening. Geraldine took home the best dancer prize and a fun time was had by all. Click HERE for more photos. Our fine BCYC member Gypsea Joe Hergenrather makes the news. Read the inspiring story about Joe by clicking on the link below...or cutting and pasting it into your browser. The BCYC 10th Anniversary Commodore's Ball at the Westin Hotel in Annapolis was a huge success. Folks began the weekend with a Happy Hour in Azure Bar followed by dinner on their own at several popular restaurants: Annapolis Grill, Fado's and/or Carpaccio's, all within a block of the hotel. Miss Shirley's cafe proved to be a popular place for breakfast and lunch for those staying in the hotel on Friday and Saturday nights. As a matter of fact several tables of BCYCer's took over breakfast Sunday morning at Miss Shirley's with their laughter. Just ask JJ who provided comic relief for the tables. The Westin (which is in the Park Place complex on West Street) proved to be an extremely convient venue as folks could walk along West Street to various shops, bars, restaurants etc. Once you parked your car, you didn't have to return to it until you left on Sunday. The Ball itself had a huge attendance--around 80 people. WOW! Everyone noshed on fabulous appetizers and cocktails, including crab tacos and lobster cobbler. The dinner began with a procession of all of the Commodores, beginning with the incoming Commodore Steve Bacon and ending with our very first Commodore John Campbell and his wife Carol Campbell who designed BCYC's burgee. Everyone welcomed and applauded their leadership over the years. Vern Penner was our Master of Ceremonies and did a great job keeping everyone entertained. Dinner was another delicious experience whether you had the rockfish, pork or chicken. Everyone raved about the food and service! Dinner was followed with dancing to Robin and Rhythmix, a great 7 piece Band, and the dance floor was never empty. Of course no Ball would be complete without the Changing of the Watch and the new slate of officers. Outgoing Commodore BIll Falk led the ceremony and Steve Bacon addressed the group letting everyone know his vision for 2012. The Holiday Brunch was a splendid way to end the year. On December 11th the Club held a brunch at Oyster Cove in Grasonville which was a nice change from the usual observation of the Lights Parade at the Annapolis Marriott. Hosted by Juliana Nedd, JJ Sullivan, Michelle and Richard Sanger, a brunch of appetizers, roasted turkey, home cooked brunch casseroles and desserts were served along with mimosas, bloody mary's and assorted juices. Hilarity ruled the day during the "White Elephant" gift exchange moderated by John Loving. A stuffed crab (from a prior white elephant exchange) and a life size head of a blow-up moose were the most outrageous.